June 1, 2002 0 comments on "Planting and Care for Buddleia (Butterfly Bush)"
Buddleia, also known as, ‘butterfly bush’, is one of the most beautiful and easiest flowers to care for. The blooms may be purple, white, pink, or red and appear in late summer. The leaves are gray-green and range from 4-10” long and are 1-3” wide. Even though butterfly bushes are an easy plant to grow, if you follow the tips below, you will greatly improve the bloom. Although caring for a Buddleia may be easy, it is important to plant your butterfly bush in the right spot. Buddleia will grow in almost any soil and prefer full sun to light shade. ‘Butterfly Bush’ will perform best in moist, well drained soil. Planting Buddleia in a spot that in protected in the winter will also improve the bloom. 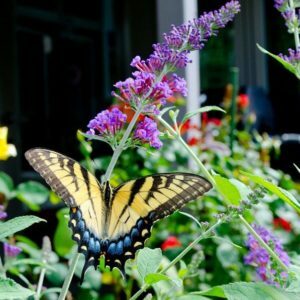 Planting a ‘Butterfly Bush’ is best done in spring or fall. Depending on the variety, place the plants between 5 and 10 feet apart. After you have selected the site, prepare the bed by tilling the soil to a depth of 12” mixing in a combination of peat moss and compost. Then dig the hole about twice as large as the root ball. Set the plant in the hole so that the top of the root ball is even with the soil. Carefully replace the soil and firm the soil. Water the plant thoroughly before applying a light layer of mulch. In the spring, a light application of fertilizer will ensure a stronger bloom. Once the plant has taken hold in your garden it will require almost no maintenance. Removing the spent flowers will encourage additional blooms throughout the bloom period. In most areas, it will die back to the ground during winter and bloom from the current year’s growth. If it does not die back in your region it can be pruned back to the ground by hand. Butterfly bush should be transplanted during the winter dormant season for best results. Buddleia is generally pest resistant with the exception of spider mites during stress. Alan Summers, president of Carroll Gardens, Inc., has over 30 years experience in gardening and landscape design. He has made Carroll Gardens one of America’s preeminent nurseries, having introduced more than 20 new perennials and woody shrubs over the years and reintroduced numerous “lost” cultivars back to American gardeners.